Marketing Fundamentals summary 1-4, 6-9, 13 This summary contains allmost the information (except for paragraph 4.6, chapter 12!! and including marketing.com chapter 5) that you will need for the exam marketing planning in term B of the first year of International Leisure and Tourism Management. 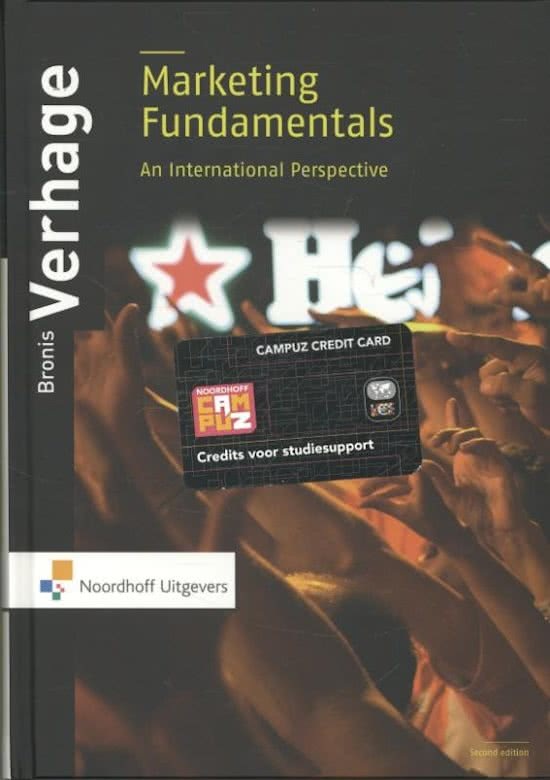 Marketing fundamentals, Bronis Verhage Summary marketing fundamentals, Bronis Verhage. NHTV marketing year 2 2015/2016. Chapter 1 (1.1, 1.2, 1.3, 1.4), 2 (2.1, 2.3, 2.4, 2.5, 2.7), 3 (3.1, 3.2, 3.3), 4 (4.1, 4.2, 4.3, 4.4, 4.5), 6 (6.1, 6.2, 6.3, 6.4, 6.5), 7 (7.1, 7.2, 7.4, 7.8), 8 (8.1, 8.2), 9 (9.1, 9.2, 9.3, 9.5, 9.6), 12 (12.1, 12.2, 12.3, 12.4, 12.5, 12.6, 12.7, 12.8) and 13 (13.1, 13.2, 13.3). Marketing chapter 15 Perfect summary for passing the exam has also ensured that I got my first year certificate. Marketing Chapter 8 till 14 Summary of the chapter 8, 9, 10, 11, 12, 13 and 14. Samenvatting Marketing Fundamentals Summary of the book Marketing Fundamentals. Sur cette page, tu trouveras des résumés, des guides de révision et bien plus de livres de révision Marketing fundamentals, écrits par Bronis Verhage. Les résumés sont écrits par les étudiants eux- mêmes, ce qui te donne les meilleurs renseignements sur ce qui est important de réviser dans ce livre. Les sujets tels que Marketing, Marketing Fundamentals, marketing, Verhage, NHTV, Marketing fundamentals, Bronis Verhage & marketing fundamentals seront traités.